It started with the friendship between two men who were in the right place at the right time, two men who had an idea which would grow into the highest valued start-up of all time. The successful high-tech duo is not the first of its kind: Steve Jobs and Steve Wozniak, who transformed Apple from a garage start-up into a multi-billion corporation; Microsoft founders Bill Gates and Paul Allen; or the “Google Boys” Sergey Brin and Larry Page are all examples. An Israeli with Kibbuz experience from Tel Aviv and an American from Oregon with hippie commune background join forces to found a start-up that changes the way we work. But Adam Neumann, 39, and Miguel McKelvey, 45, could not have been more different. Adam grew up in Israel, a country in a constant state of alarm. He brought drive and creativity to the table, but also experience with the workings of small communities, picked up firsthand during his time in a kibbutz. Miguel, on the other hand, grew up in a hippie commune in Oregon, a US state notorious for its bustling alternative Scene. It started with GreenDesk. After both Neumann and McKelvey had gathered their first experience as entrepreneurs on the New York tech scene, dubbed Silicon Alley, they joined forces in 2008 and founded GreenDesk. The idea was straightforward: instead of opening their laptops in Starbucks, the founding duo imagined a future where the high-tech nomads of the digital era would be offered a cool workspace. With GreenDesk, the founders had created an environmentally friendly office space suffused with the feeling of a commune. The concept was a runaway success. 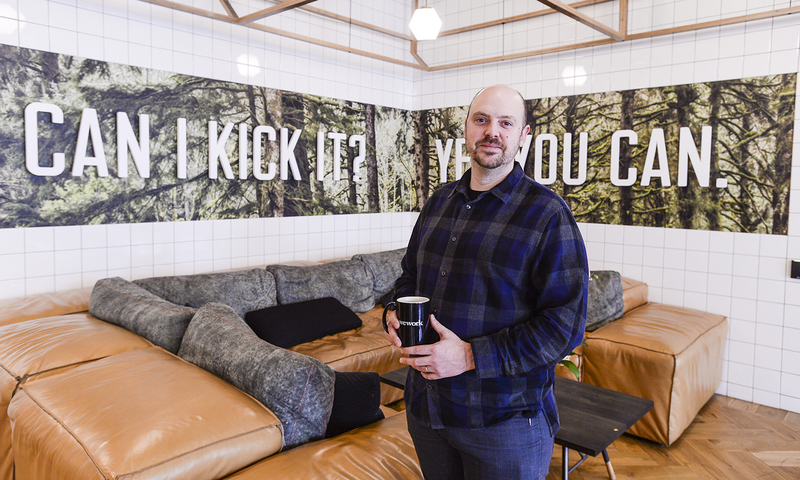 Two years later, Neumann and McKelvey invested the proceeds from the freshly sold start-up into a much larger communal office in Manhattan’s SoHo district, and they found a name for their new venture: WeWork. Again, the concept was simple: all obstacles to creative, efficient and target-oriented work, such as having to get an internet connection, searching for a suitable office space, shopping for insurance contracts and other administrative tasks, were to be minimized to directly focus on teamwork, transparency and collaboration. Concretely, this philosophy also informs little details: coffee and tea are available all day; the fridge stocks Coke and beer at just the right temperature. The founders stressed the communal aspects of work at every step along the way, thus creating the workspace of the future. By now, the rest is history—and what a history it has turned out to be! WeWork is an incredible success story: valued at 20 billion dollars, 2.000 employees, 230 office spaces in 71 metropolis’ across the world. And 210.000 members as part of a global work community. Founders as billionaires. Today, the New York start-up WeWork is valued at more than 20 billion dollars (16.25 billion euros). The company is the world’s largest renter of co-working spaces and communal offices, which translates to cool office complexes with flexible rental plans, also on a month-by-month basis. All that in every important city of the world: WeWork now boasts more than 230 office locations in 71 metropolises in 21 countries, with a community of 210,000 members forming a global WeWork network—and both of its founders have long since become billionaires. With WeLife, the company’s newest venture, WeWork is poised to create a new way of communal living. In the WeWork headquarters. OOOM visits the company’s global headquarters in New York’s Chelsea district. Top manager Dave Fano, whose ornate job title identifies him as “Chief Growth Officer,” leads us through the airy open-plan offices. On three floors, more than one hundred WeWork employees go about their work in the warehouse-style building. There are long communal tables made of responsibly sourced woods, sound-proof cabins for conference calls, individual office spaces for smaller teams. Employees refresh themselves in several kitchens, where the supply of coffee, tea, snacks and instant food never ceases. There is even space for a number of arcade machines, set up to provide relaxation when needed. The only start-up office staple that is missing here are ping-pong tables. “It is too distracting to have people looking for their balls everywhere,” says Fano, as he shows us around. The three floors are connected by huge stairs in the center, with little sitting corners in each of the mezzanines. Everything is meticulously planned and thought out; there are bicycle mounts and even a hairdresser. It goes without saying that WeWork is a hi-tech operation—in fact, it feels almost like we are in a sci-fi movie. The power sockets only activate once a member has logged in for a particular work-station via a specific tablet Kiosk.